I have an announcement, something that I have been holding in and protecting for some time now. It started with a dream then it moved over to a wish and then it turned into something real, something I have been able to shape, contour and cultivate for months now. Yesterday morning November 12,2018 it all changed for me, that wish connected me ever so slightly to chef’s and cooks I have looked up to and learned from for years. Julia Child the Master of French Cooking, Edna Lewis and her soul feeding food, Ina Garten and her flawless simply elegant meals, Ree Drummond and her lifestyle nourishment. Samin Nosrat and her explosion of the four food flavors. Gordon Ramsay and his Military perfection in the kitchen, Rachael Ray and her ease of preparation, Martha Stewart and her determination of home cooking perfection. Bernard Clayton and his layered pastry, Alice Waters and her dedicated seasonal movement, Americas Test Kitchen and their persistence to find the perfect recipe, Rick Bayless and his flavorful pallet of spice. 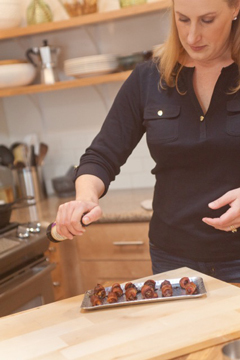 Ruth Reichel and her passion with food, Jack Gilmore and his dedication to the Texas farmer, Steven Raichlen and his ability to tame smoke and fire. All the above names and countless others have one thing in common they are cookbook authors and as of yesterday I joined that list too. I am a published cook book author! 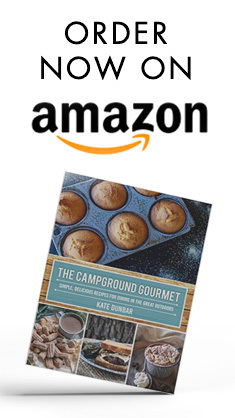 I give you, The Campground Gourmet, Simple, Delicious Recipes for Dining in the Great Outdoors. Available now on Amazon. I can not begin to tell you the amount of work that went into this project however, I can tell you about all the amazing and dedicated individuals that have helped me put all the pieces together. Stephanie and Jeremy Puglisi creators of RV Family Travel Atlas, they are my editors, they have spend countless hours editing, creating and guiding me along this adventure. I am truly grateful to the both of you and your belief in me, this cookbook and our friendship, thank you so much. Steven Dunbar, my love and champion. You have always, always encouraged me to take adventures and just go for it. I can not think of a single time in our 12 years of marriage (13 on Friday 11/16) where you have asked me not to do something, you have never said no. But, I’m certain when I am in the thick of it you wish you had. I love you husband, thank you so much for all your help, encouragement and the strongest shoulder I could ever rest my head on when I was too tired to go any further. Oh, and for cleaning up when that raccoon destroyed my photo set on the patio, you are a saint. To my children, you were my first true recipe taste testers, I made all your baby food when you could eat solids. I found out by trial and error what all your favorite cookies, meals, smells and tastes are. I have watched all three of you grow up and develop new tastes and favorite food memories. I love when you ask me to make your favorite meals, even if it is a box a macaroni (Paige) or a beurre blanc sauce (Andrew) or a perfect pan seared steak with a fried egg (Sean). My friends and family who have been in the loop and truly kept my project safe and protected until yesterday when it was out there for everyone to see. Your encouragement, help and cyber cocktail time truly made this experience a magical gift. You helped me choose recipes, look at images and you also told me that when I made it big I owed all of you an Airstream or one heck of a vacation…I love each one of you and I appreciate your loyalty and friendship more than you could ever know. I have always felt at home or in my comfort place at a campground, sitting in front the fire watching the golden coals smolder and send tiny shooting stars into the sky. The fire at a campground not only warms you up at the end of a long day of hiking or swimming in a lake, it feeds you. You can place a piece of cast iron over the coals and slip a fresh caught trout in that pan with onions, herbs some olive oil and a bit of salt and pepper and you have one of the best over the fire flavor meals anyone can create. It’s the fire, smoke and quiet, the total concentration of keeping the temperature there in just the right zone. It’s the laughter while watching a marshmallow swell with the heat of the fire only to spontaneously catch on fire and smolder away. It’s that crisp morning air and a rich hot cup of coffee in your favorite camp mug- it’s the great outdoors. 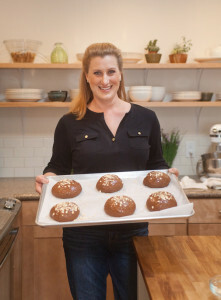 There is so much my cookbook is about, the recipes are perfect for at home, at a park, sharing with your family at a celebration or sitting in Jackson, Wyoming under the peaks of the Grand Teton and all her beauty. 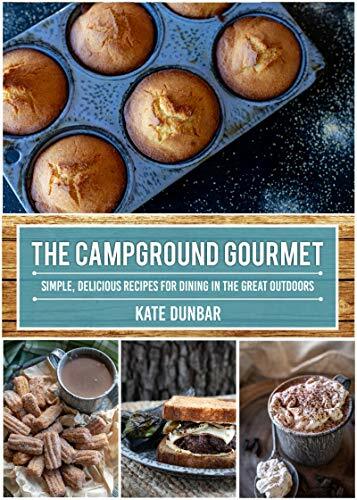 I’m Kate Dunbar, The Campground Gourmet, I tell stories through food and help individuals create culinary adventures with my recipes.